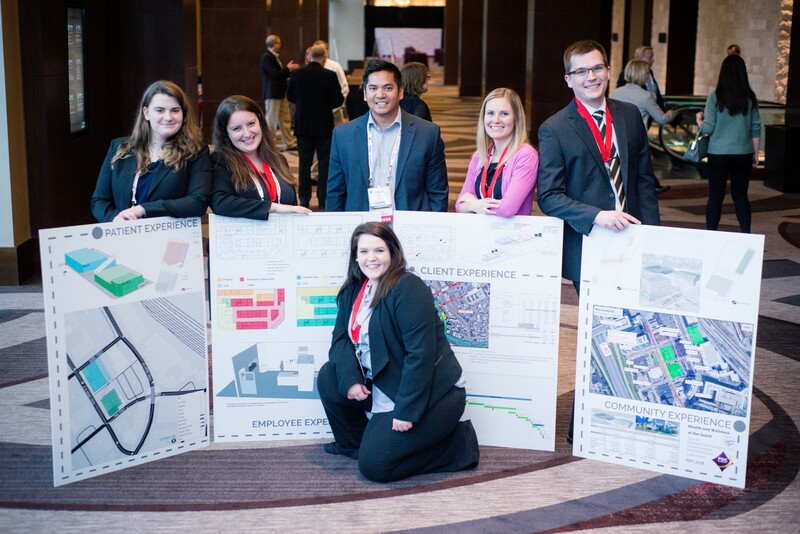 Last weekend, four Belmont graduate nursing students participated in a hospital design challenge with teams of architecture, engineering and construction management students from across the nation as part of the PDC Design Summit in Nashville. The PDC Summit brings together senior leaders working in all disciplines of health care planning, design and construction to learn, network and discover ways to create value for the health care built environment. Each year, as part of that conference, students participate on interprofessional teams to design a health care structure (within 48 hours) and compete as part of a juried experience. As the first year that nursing students were included in the experience, Belmont’s students were supported by the Nursing Institute of Health Care Design. They designed a micro-hospital to be built in the Gulch and were introduced to the project at their host architect firm’s office, Earl Swensson Associates and visited the construction site prior to the design process. The Belmont students helped their teams understand a realistic model of care, patient and clinician work flow, necessary adjacencies of departments, infection control, HIPAA, patient and employee security concerns, noise considerations and many other factors. The students determined nurse staffing models, set nurse to patient ratios and calculated staffing budgets.